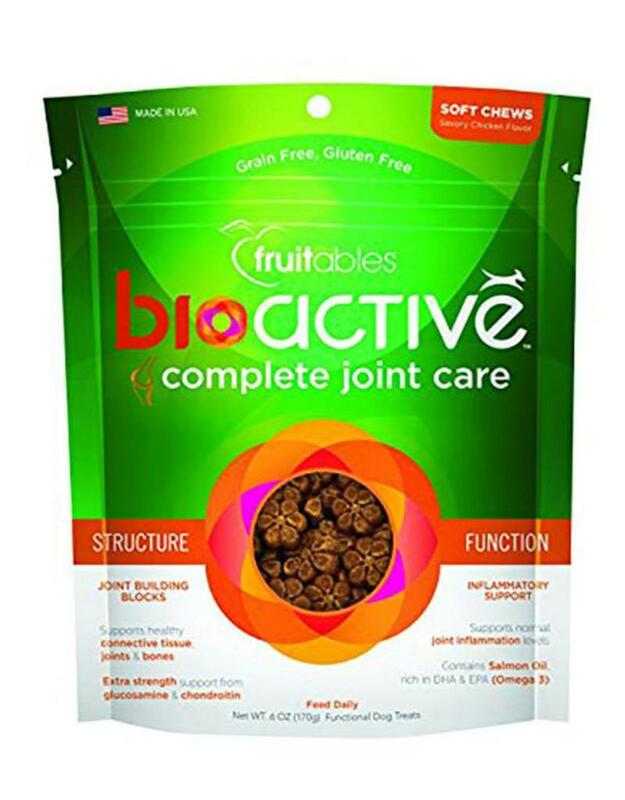 Fruitables BioActive Complete Joint Care Soft Chews Dog Treats keep your furry sidekick healthy, active and ready for the next adventure. This functional yet savory chicken-flavored treat provides the building blocks of complete joint care with extra strength support from glucosamine and chondroitin. Calcium is included to keep bones strong, while inflamed joints get support from salmon oil that’s rich in omega-3. These tasty chews are great for any dog, from the seasoned agility competitor to large breeds and aging seniors. Ingredients: Chicken, Chickpea Flour, Sweet Potato, Flaxseed, Honey, Vegetable Glycerin, Tapioca Starch, Salmon Oil, Natural Flavor, Glucosamine Hydrochloride, Dried Whey, Phosphoric Acid, Egg Shell Meal, Chondroitin Sulfate, Calcium Carbonate, Mixed Tocopherols (To Preserve Freshness), Sunflower Lecithin.